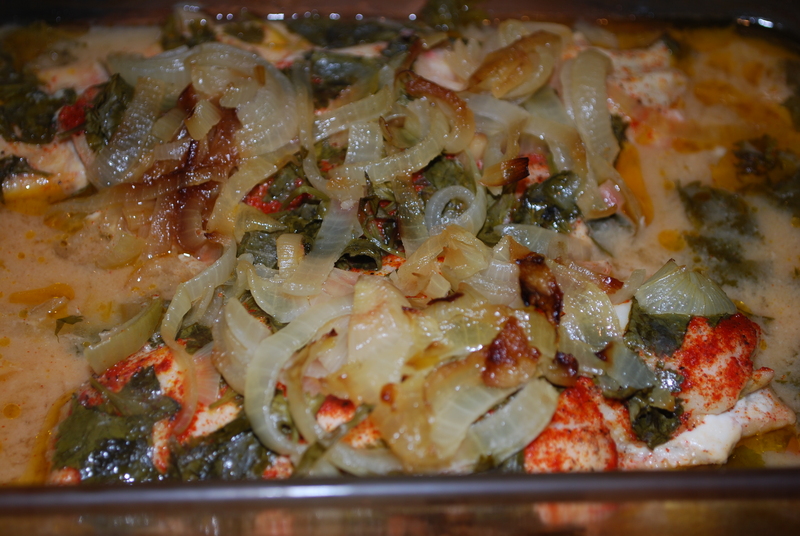 I make several different versions of this meal depending on the vegetables on hand. This is our weekend breakfast (or vacations when we are home to eat breakfast together). Vegetable and protein is the base. Grains can be added in the form of whole grain bread/toast or whatever left over grains that are in the fridge. Dairy to round off the meal in the form of cheese. Simple, delicious, healthy and keeps us going strong all morning. Preheat a large heavy bottom skillet over medium heat. 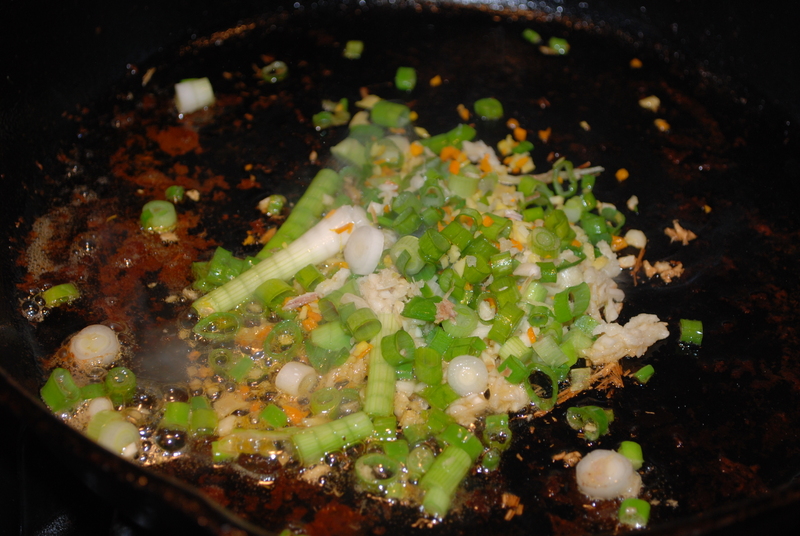 Add oil, onion, celery and salt. 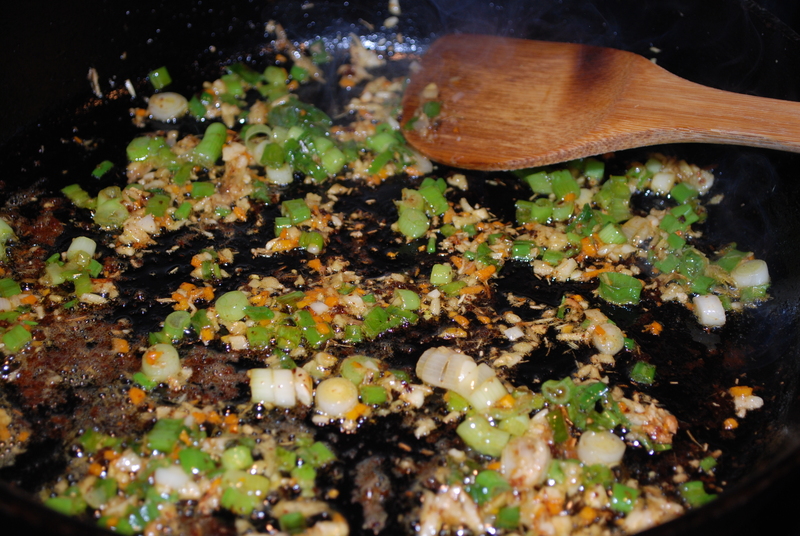 Cover and sauté for a couple minutes until the onion and celery soften. Add tomato, cilantro and pepper. Stir, cover and cook a few minutes until the juices cook out of the tomatoes. 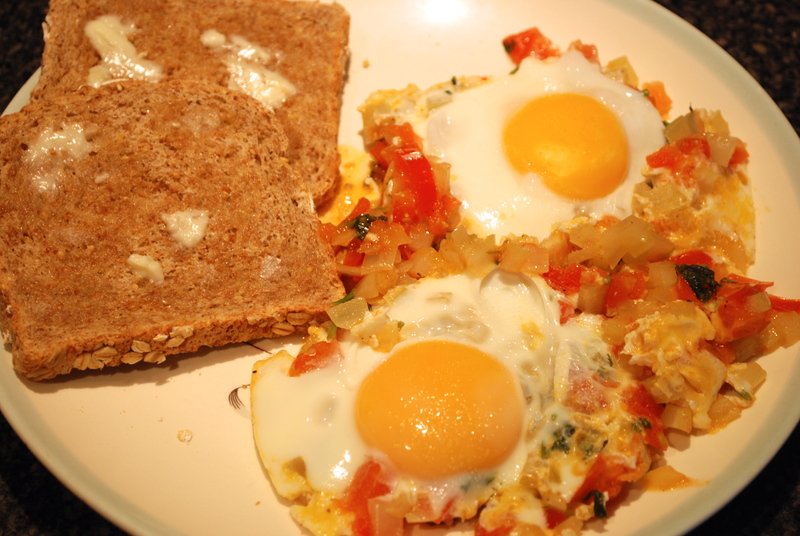 *if you are having toast, get that in the toaster now/or warm up left over grains in the microwave* Crack the eggs on top of the cooked vegetables (we like our eggs with a “runny yolk” but you can pop the yolks) cover and cook until the whites of the eggs set. Remove from heat and scoop out onto a plate as is or with grains on the side. Cheese can be sprinkled on top. This entry was posted in in the kitchen and tagged breakfast, celery, cilantro, delicious, dinner, eggs, grains, healthy, lunch, meal, simple, toast, tomato, whole on April 17, 2014 by lenapietri. 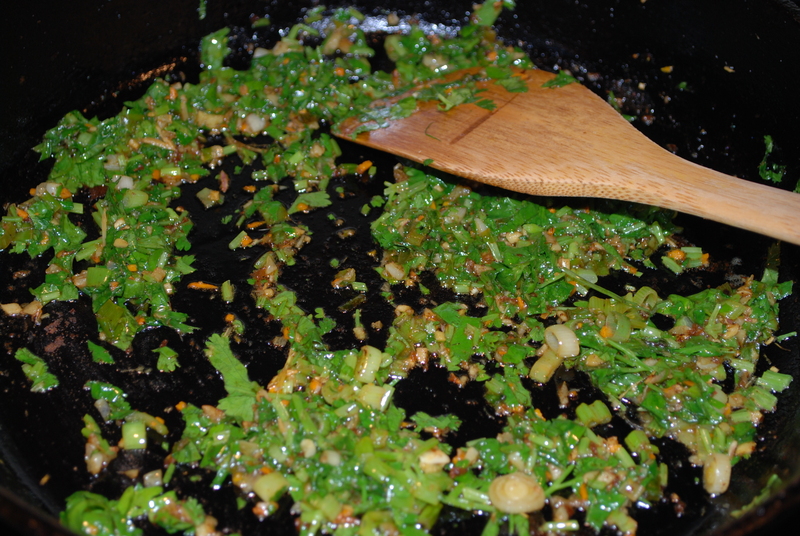 Saute onion in olive oil over medium low heat until soft and translucent. Meanwhile- toss sweet potatoes with olive oil and spread in a single layer on a baking sheet. Back to the fish dish- stack flounder in a glass baking dish 3 or 4 high. Sprinkle with salt, pepper and paprika. 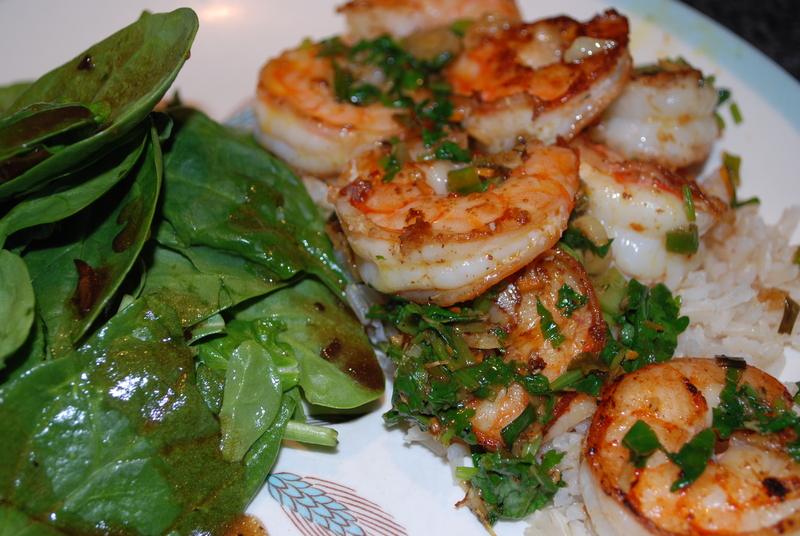 Pour onions with olive oil over the fish and top with lemon juice. Cover the fish with aluminum foil. Place the sweet potato pan and fish dish in the oven and bake for 30-45 minutes, until the fries are soft inside and crisping on the outside. Remove from oven and sprinkle fries with salt. Combine all ingredients in a glass jar and set aside. Preheat a small pot with 1 1/2 inches of canola oil over high heat. Peel green plantain (slice through the skin on the “seams” and with fingers separate and pull to remove. Some will peel easily but others come off in small tedious chunks). Shred plantain using the small section of a grater into a bowl. To test the readiness of the oil place a single strand of the plantain in the pot. If it sizzles and rises to the top immediately it is hot enough. 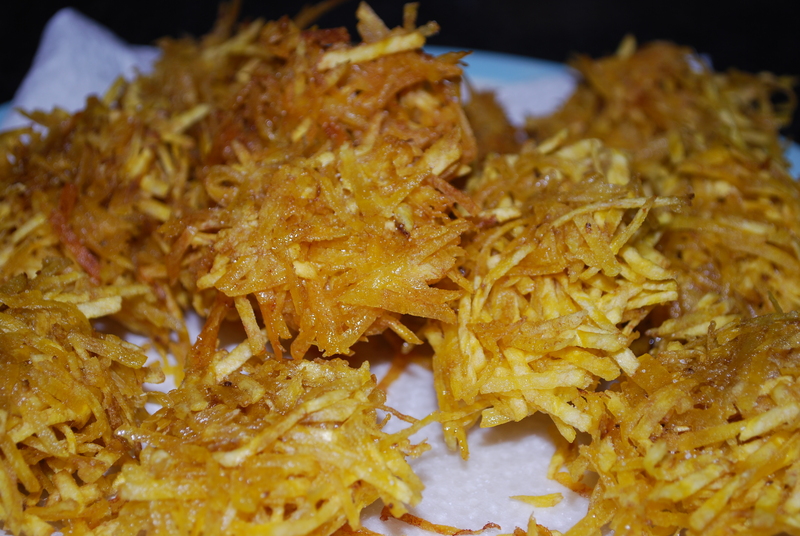 Using two tablespoons grab and squeeze together the shredded plantain and place into the hot oil. Fry just a few at a time, don’t crowd them, so that they fry hot and fast. 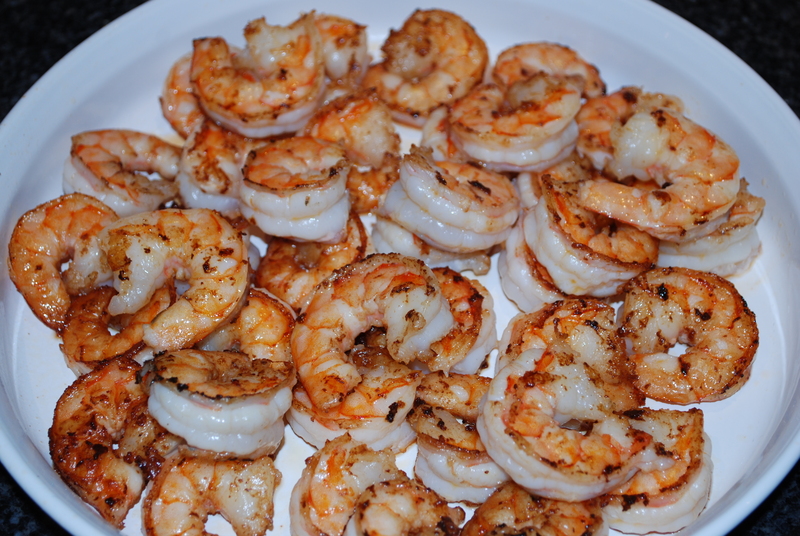 Remove with a slotted spoon or two forks and place on a plate lined with paper towels to absorb the excess oil. Repeat until done and sprinkle with salt. 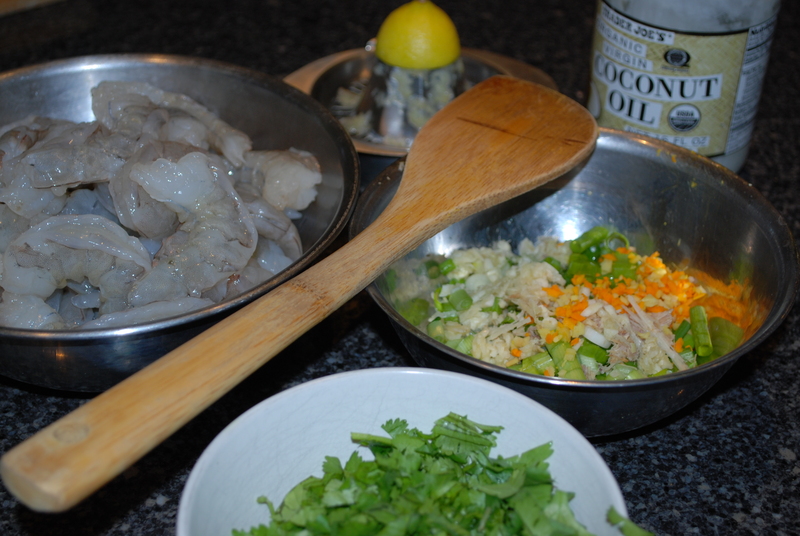 This entry was posted in in the kitchen and tagged aranitas, dinner, flounder, fried, fries, fritters, green, inspired, lemon, menu, mojo, onion, plantain, puerto rican, recipe, sauce, style, Sweet potato on April 17, 2014 by lenapietri. I always look forward to April vacation. The sun and warmth returned just in time on Saturday, Sunday and Monday. 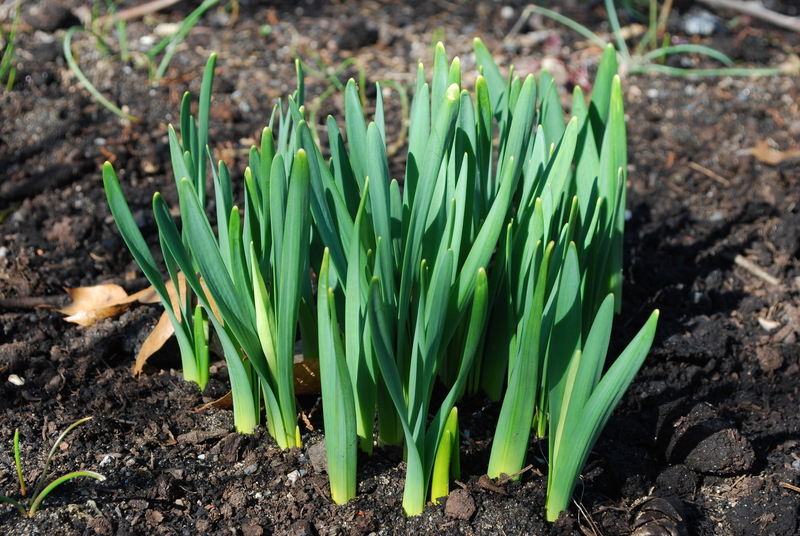 I breathed a deep sigh of relief at the end of a long cold winter. It was like little summer- working in the garden, getting the furniture out on the sunny patio to enjoy food alfresco and simply celebrating the end of winter and the dawn of a new growing season. 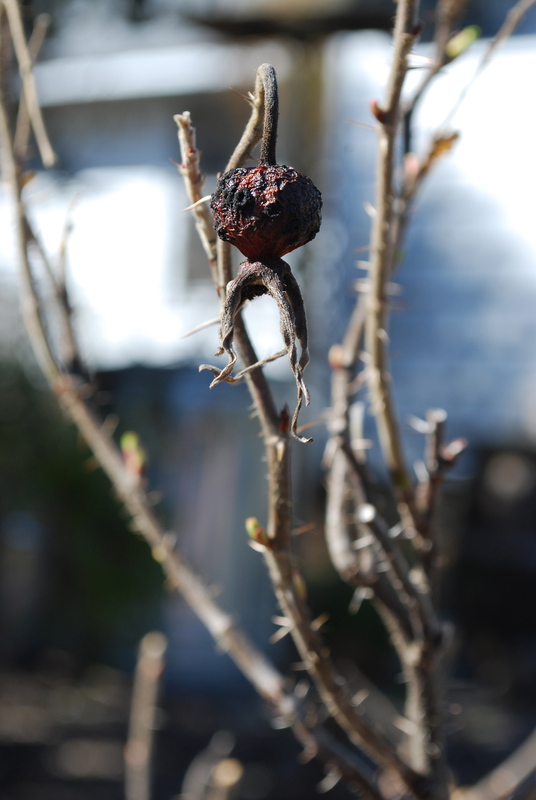 One lonely and forgotten rose hip still clings to the stem of the Rosa Rugosa that is waking up. These are some of the earliest plants in the garden; Elderberry (top left), Gooseberry (top right) and Bogless Cranberry (right). 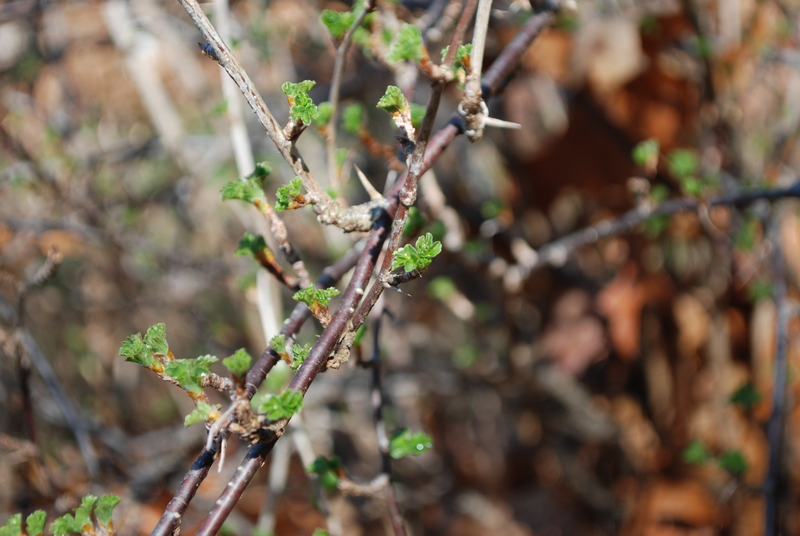 The Gooseberry bushes are well established, they were some of the first plantings we did in the spring of 2001. 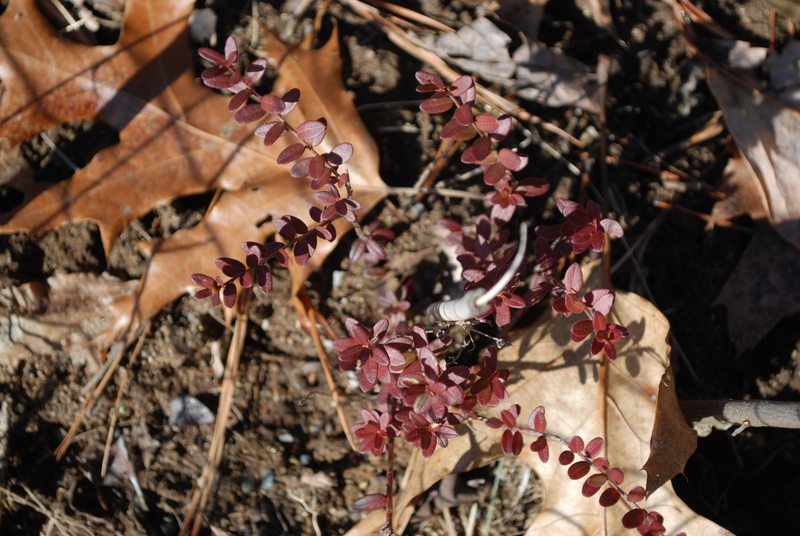 The Elderberry and Cranberry are young, I planted them last year and am happy to see that they survived the extreme heat of last summer and the extreme cold of this past winter. 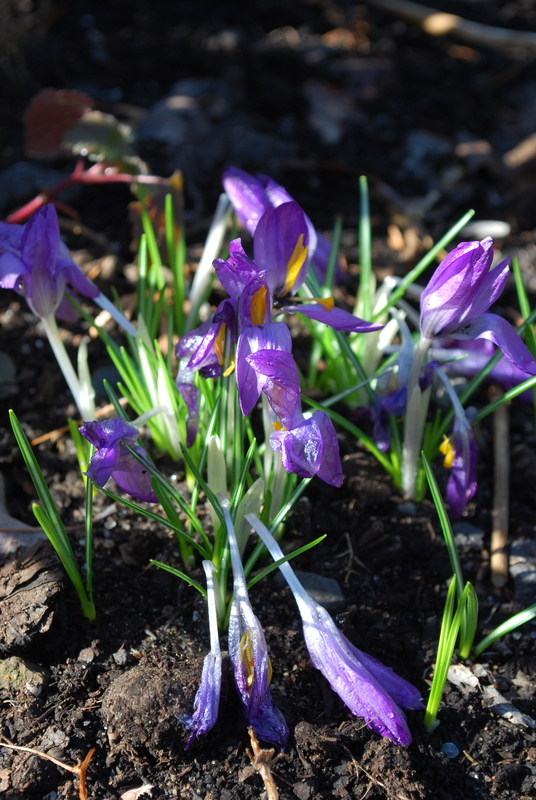 The crocuses are dying down after a brief bloom. The snow and leaves were covering them much longer than anyone would have liked. 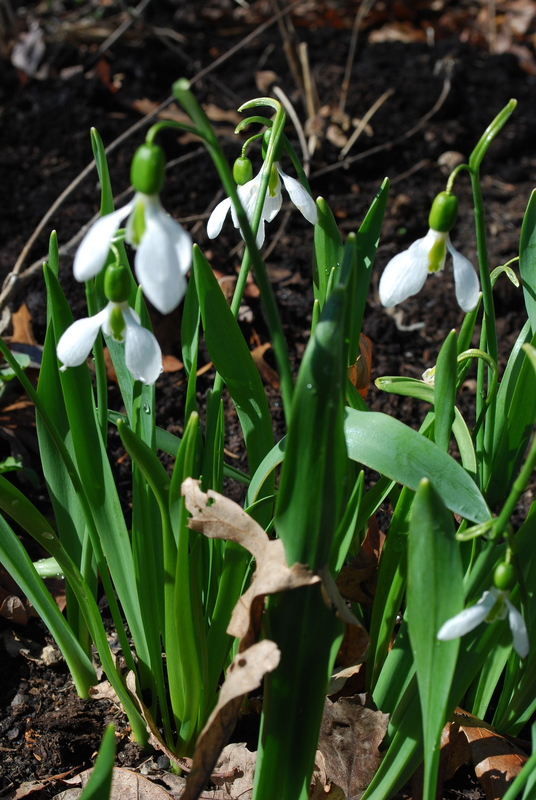 The snowdrops are longer lasting and still blooming proud among the dead leaves from last fall. 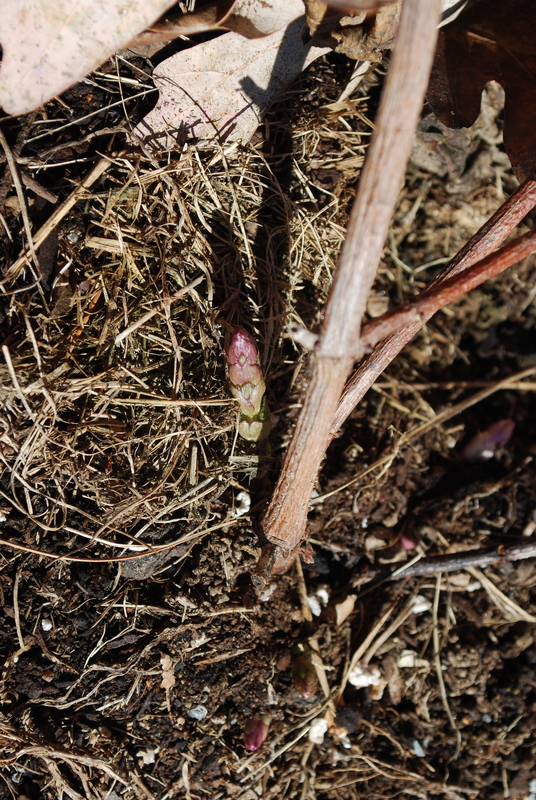 Hop bines are emerging, reminding me that they need to be transplanted. Last year they didn’t have the height that they need to grow along the side of the garage. I moved them to the hot tall brick facade of the house so they will have all the space they need to grow. 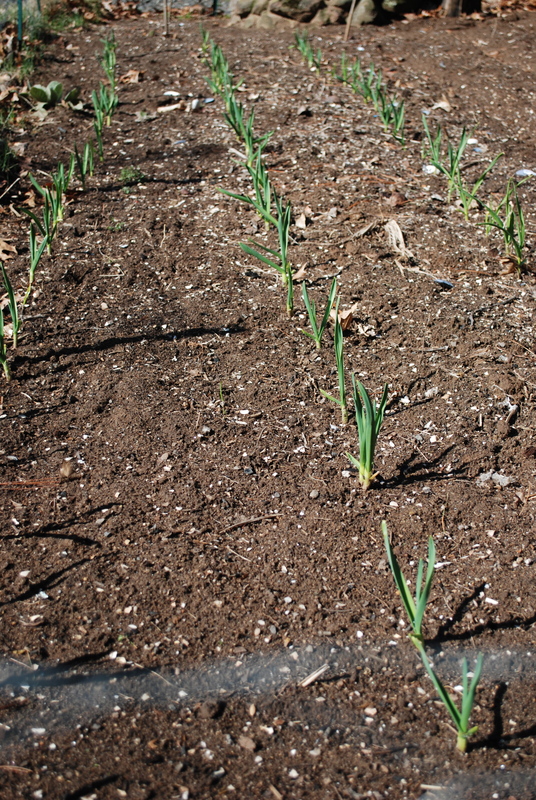 Garlic, planted last fall, is growing strong (right). They will be some of our first produce harvested this season. In hind sight I should have planted a full field. Note to self- “plant as much as possible this fall”. Garlic essentially takes care of itself. All I need to do is plant and harvest. Yes, it is time consuming. 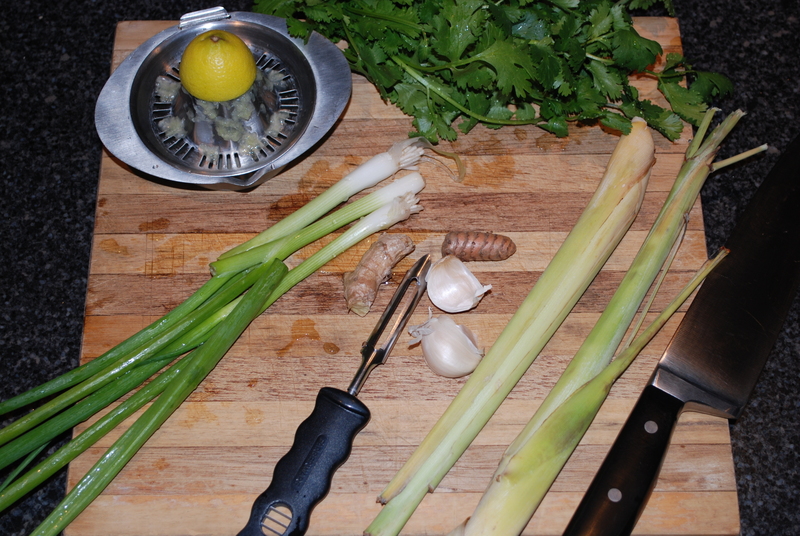 But the taste of fresh garlic and knowing it is grown with care makes it all worth while. To juxtapose the weather from Saturday to Wednesday take a look at the two photos below. 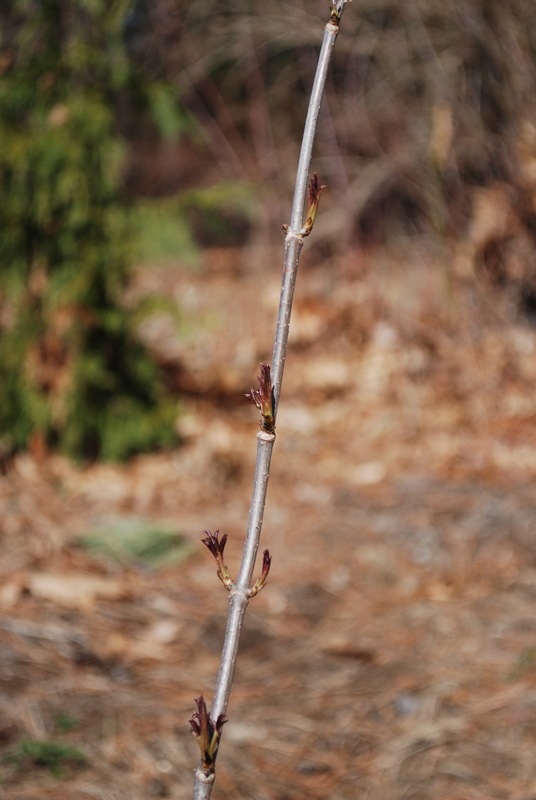 On Saturday the daffodil buds were just starting to show. Wednesday in the pouring rain the first daffodil bloomed. 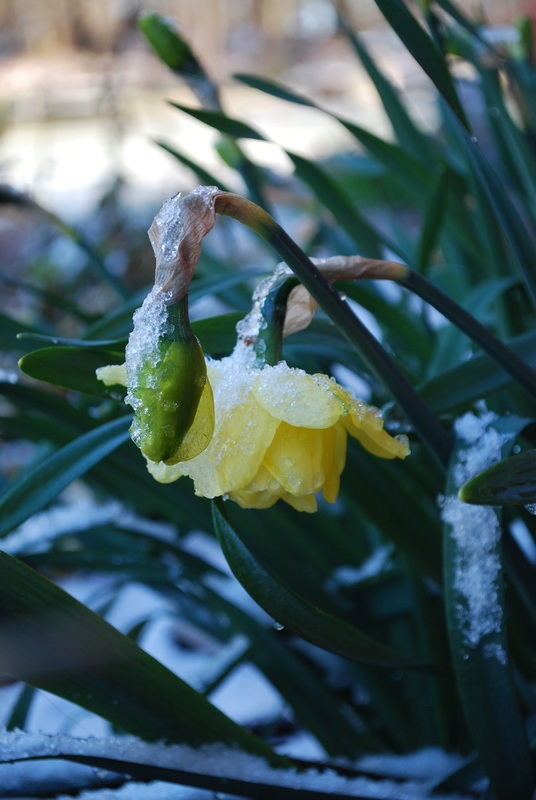 Today I woke to an icy crust of snow covering the spring green and blooms. This entry was posted in in the garden on April 16, 2014 by lenapietri. Preheat a medium sized skillet to medium. Prepare vegetables. 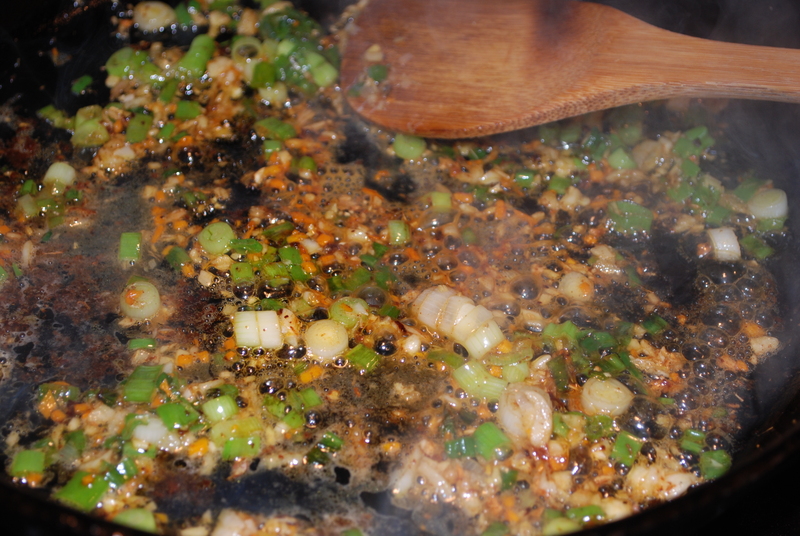 Add oil to pan and heat a bit. Add onions and mushrooms and sauté till tender. Back to the vegetables- add salt, pepper and thyme, stir and simmer 1 minute more. Add cilantro, stir and sauté 2-3 more minutes until it wilts and the smell is amazing. 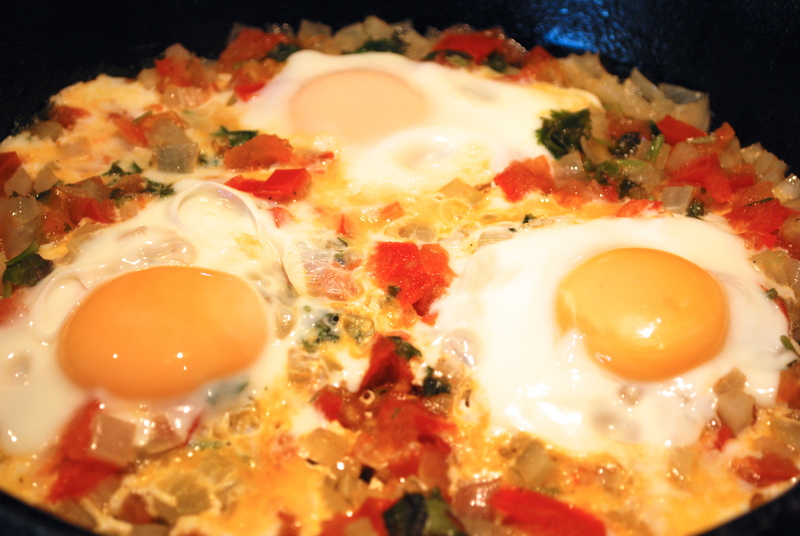 We like the vegetables heaped over our eggs but you can segregate your plate if you wish. This entry was posted in in the kitchen and tagged breakfast, cilantro, eggs, fresh, mushrooms, onion, portobello mushrooms, sunny side up, vegetables on April 12, 2014 by lenapietri. 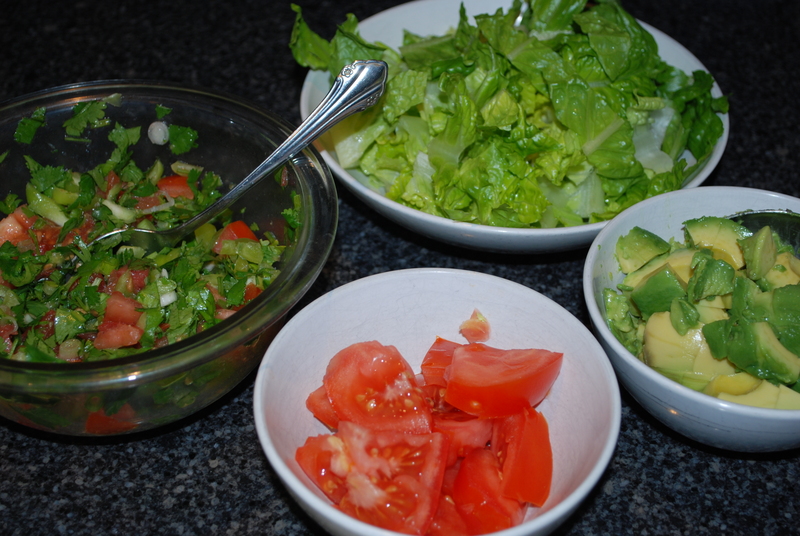 This recipe makes 7- 6 1/2 inch wraps; adjust according to how many mouths you are feeding. Mix flours and salt in a bowl. (I grind my own oat flour in a coffee mill reserved for gluten free grains, nuts, seeds and spices; don’t use the one you grind your brew in or you will get all sorts of funky flavors. The besan can be found with other gluten free flours or in Indian/Asian markets). Add the hot water and mix with a whisk until there are no lumps and the batter is creamy. Add 1/4 cup more water and mix well. Set aside for 15 minutes (or until your fillings are prepared). 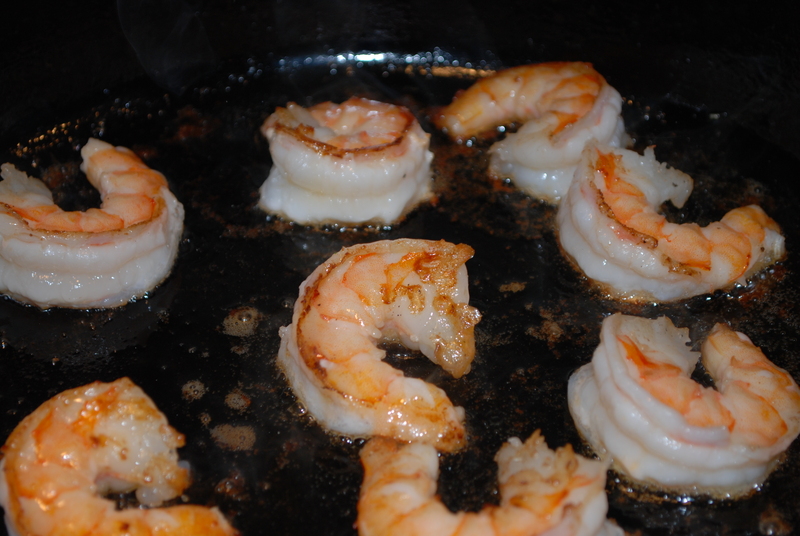 Preheat a medium sized heavy frying pan, I like cast iron- nature’s non-stick, over medium high heat. Add an additional 1/4 cup (or so) of water to make the batter thin like crepe batter. When the pan is really hot, add enough olive oil to coat the pan, pour the batter into the pan to cover about 1/2 of the bottom then twirl the pan to coat the bottom with the batter. When the batter is set on top it should be golden on the bottom and ready to flip to cook to the other side. Repeat until all of the batter has been prepared. Fill as desired. 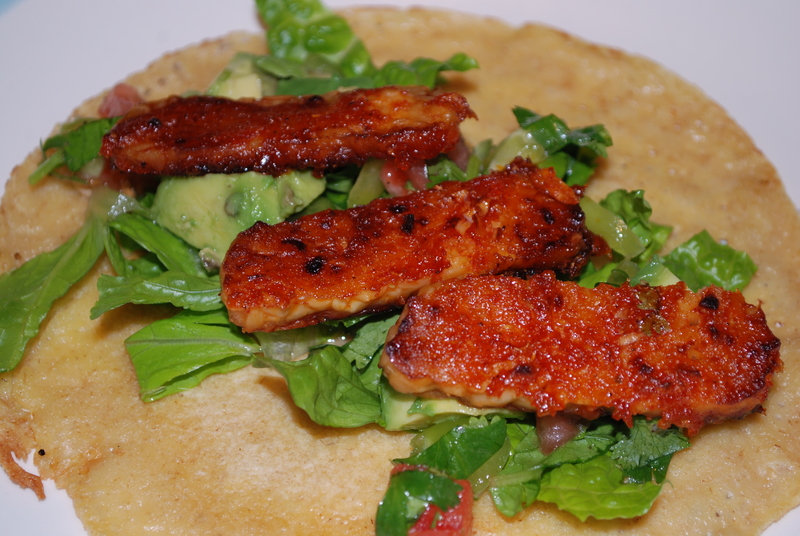 We filled ours with “barbecued” tempeh, fresh salsa, romaine lettuce,avocado and tomato. Heat a large cast iron skillet over medium high heat. Add olive oil to generously coat and arrange the tempeh. Combine remaining ingredients in a small bowl. Fry until golden and crisping on the bottom then turn off heat. 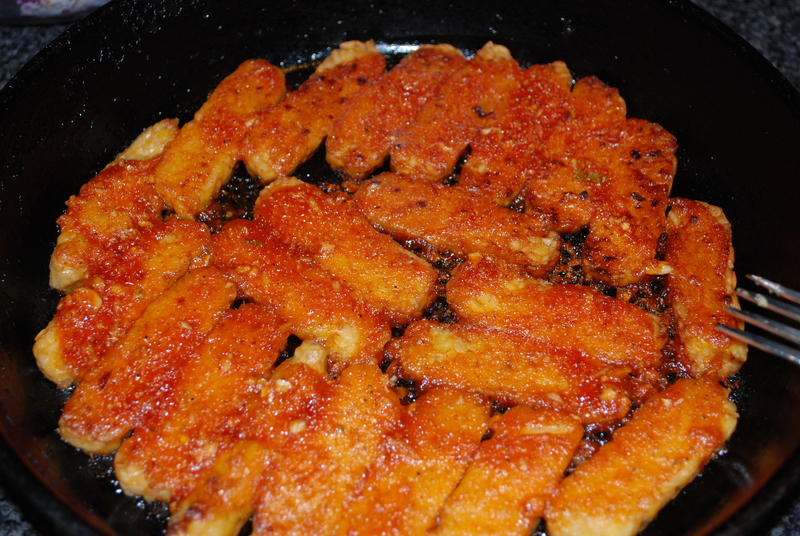 Pour the sauce over the tempeh and spread to coat the pieces. 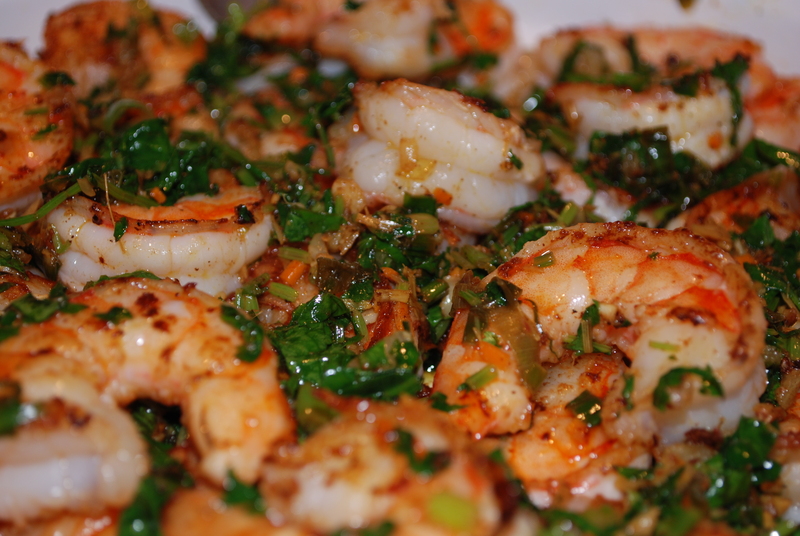 Place under the broiler for 5-10 minutes until crispy. Enjoy in your healthy wrap! 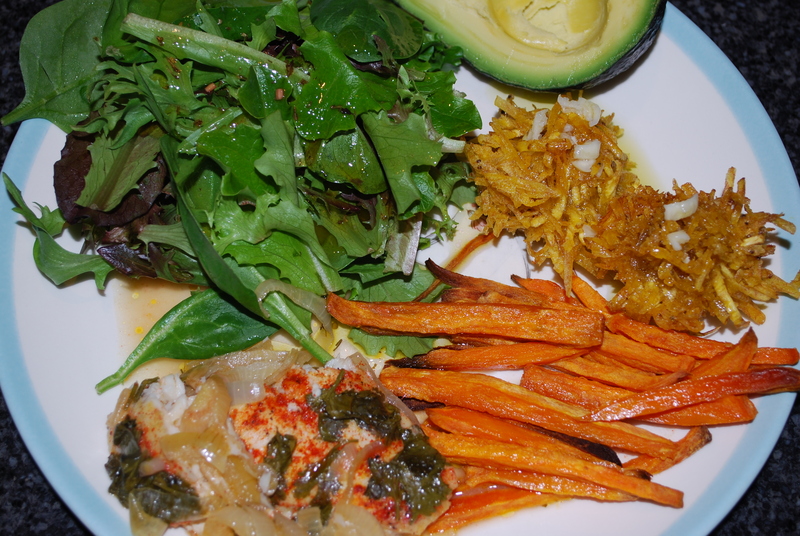 This entry was posted in in the kitchen and tagged barbecued, tempeh, vegan, vegetarian on April 11, 2014 by lenapietri.